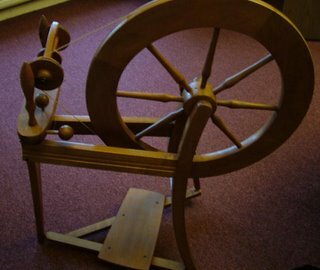 You remember a couple of weeks ago I bought a fleece at a car boot sale and I said I wanted to try my hand at spinning sometime. I couldn't NOT bid for it, could I? It was very naughty to buy it really as we're not exactly rich this month, but it will be my Christmas present, and it was an absolute bargain. It's an Ashford wheel from Kitcraft in New Zealand, in beautiful condition (though it squeaks a little) and it has the lazy kate with it as well. I am chuffed to bits - but now I really do need to learn how to spin, don't I? I am so incredibly envious! And also grinning ear to ear for you!